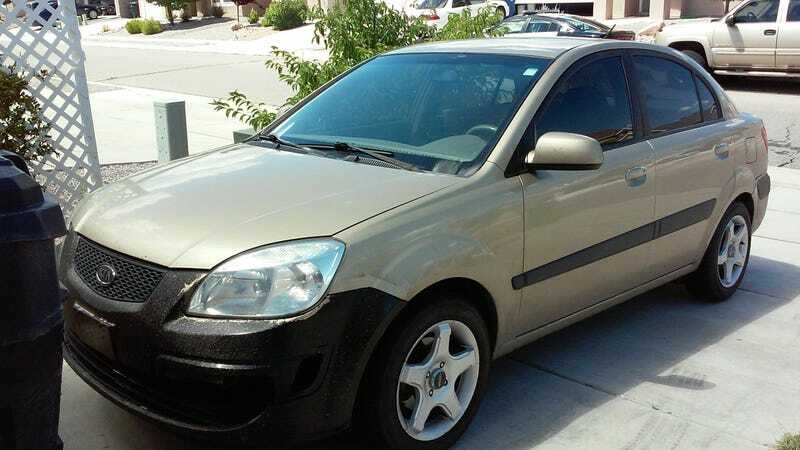 I found one of my old cellphones and accidentally stumbled across the only existing exterior and interior pictures of my infamous 2006 Kia Rio. Yes, the one I talked about in Part II of the tale of how I got my Kia Amanti. Yes I rattled canned that front end and I did it raw! It was like prom night. No protection, no clue what I was doing, and no one else besides me there to enjoy the magic hour (rounded up). The job may not have gone as envisioned but the job did get done. Mantra. I was young, I was young, oh sweet baby swiss cheese was I young. But when the words of Colin Chapman leads to your automotive spiritual awakening, goat farm it you work with what you got! Of course that spray paint kept coming off at highway speeds and when I restored the headlights the tape pulled chunks off...but the legend of Boca Negra needed to be brought to neighborhoods, for the keeeeds!! That may be an automatic but I switched between L, 2, D, and the Overdrive-Off Button far more than any manual driver. All 4-speeds were spent! This is soooo gross, especially that decade of six-layer cake made entirely of elbow sweat covering the armrest. The seatbelt buckle cover shattered and the belt wouldnt lock in, so I wrapped clear masking tape around it and it was 100% fixed as long as I didnt crash into anything. Engineering is learned on the streets. I removed all the passenger seating and was ready to find myself an old Recaro to probably drill directly into the floor rather than worry about having adjustments. I made a nice felt curtain to cover up the hole to the trunk. You know, for privacy in case some saw my wrench set in the trunk through the windsheild. If I wanted my stuff stolen then I would have bought an Accord. I just cant believe how dirty this is. But since I took a picture that tells me I never noticed it. Frightening! All this happened after I crossed the 250,000 mile mark. I had a blast driving it!! I practically peed myself thrashing it around, just go back and look at that seat! It was sold to one of the techs at the Kia dealership for $700 as is. Impounded less than a week later because the driver was on a suspended license due to DUI charges and driving an unregistered car. The Rio was replaced by another beige car, a 2012 Jaguar XF 5.0 Base. Not as pure of a driver’s car as the Kia though. It suffers from the same problem as most modern cars, too many seats and too little spray paint. Oh, here is Part I of that Kia Amanti story since some may be curious.